Nikon’s dedicated astrophotography camera isn’t planned to start shipping until next week, but Swedish astrophotographer Göran Strand was lucky enough to get his hands on a D810A for a review. The review includes high ISO noise comparisons between the D800E, D810, D810A and D3s, and covers some of the camera’s new astro-oriented features. Göran also shares sample images of daylight photos and tests how well this camera performs, despite Nikon’s recommendation not to use it for ‘general photography’. B&H has released a new, in-depth review of the legendary Canon EF 1200mm lens, and while you most likely won’t be able to afford the $180,000 price tag, it makes for a great read. Todd Vorenkamp was lucky enough to take the beast of a lens out for several shoots and survived to share some of the advantage, disadvantages and random trivia about this rare lens. The single biggest challenge I face as a photographer is finding ways to create images that are noticeably different than everyone else’s. The vast majority of photographs that have ever been taken (or ever will be) are captured from about 5 feet above the ground – eye height for the average human. One different perspective that I find particularly interesting is overhead and aerial photography. There are several (very complicated and expensive) ways to get a camera overhead, but I recently had the opportunity to review a product that makes taking overhead and aerial style photos very easy – and the results are spectacular. We recently reported the announcement of Yi’s $64 new action camera, (formally Xiaomi YI) and we’re now bringing you the first hands-on reviews and GoPro comparisons. 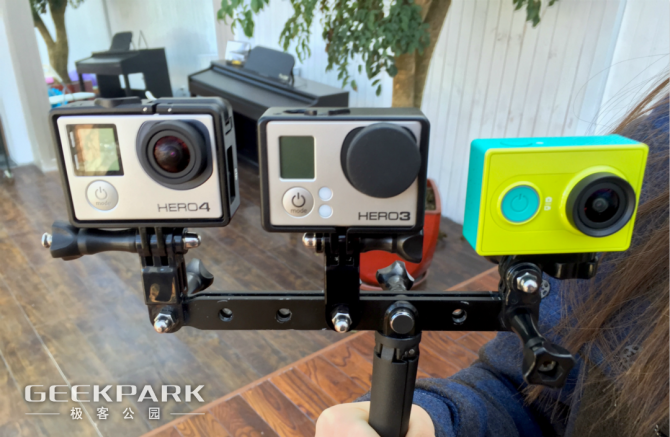 Two Chinese reviews, one by pcpop comparing the Yi Action Camera to the flagship GoPro 4 Black and the cheap SJ4000, and another by Geekpark comparing it to the GoPro 3 and 4 Black editions, reveal new details regarding the highly anticipated new kid on the block. Other than sharing new specs and features, the reviews include video, contrast and low-light shooting comparisons. One of the concerns with such a cheap camera is that cheap often comes at a cost. Does the low price indicate low quality? Overall the camera seems to give a rather impressive bang for the buck, but will it work in crowded spaces? The newly announced Samyang 135mm f/2 has caused quite a bit of excitement with its wide aperture and modest ($550) price tag. Now that all the specs have been revealed, it’s time to see how the lens compares to Canon’s version of the 135mm f/2 (@ $1,049.00 – almost double the price) . A head-to-head comparison, conducted by South Korean blog Gear for Image, brings first results of the new portrait lens. Facing Canon’s superb lens, the Samyang has its work cut out. Back when my wife and I were photographing the lovely pole dancing fitness instructors from Allure Fitness, I also used the opportunity to create some really cool and unique shots using the Spiffy Gear Light Blaster Gobo Creative Kit (B&H). Read on to find our how these photos were created. I have had a Spiffy Gear Light Blaster in my camera bag for a while now, but it wasn’t until recently that I came up with a concept that I though was cool enough to really unlock the creative potential of the Blaster. The concept that I came up with was to photograph Darth Vader with the Light Blaster, and in this article I am going to share exactly how I used the Spiffy Gear Light Blaster to create this series of photos. Some time ago, I was contacted by B&H to do a review on Impact’s Collapsible Background (Black and White 5′ X 7′). There is only one way that will allow you to take a ton of photography gear on a family trip and get away with it. Hook your family on photography. My wife is a lost cause, so I decided to try and lure my 5 years old daughter into the photography dark side. I got her a camera. Specifically, the Vtech Kidizoom Plus Pink Digital Camera. Below you can find my reasons for getting this camera as well as my thoughts and review. I would also love to hear your thoughts about getting a camera for your little one, share them in the comments.